Why Does My Computer Blue Screen? 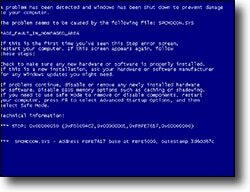 There are many reasons your computer could get the "blue screen of death". I'll review some things you can look into to help determine the cause. I keep getting a “blue screen of death” and the following error message: PAGE_FAULT_IN_NONPAGED_AREA and a bunch of other lines and the computer locks up. What is causing this and how can I fix it? Unfortunately, with only that to go on, there are hundreds, if not thousands, of possible answers. To really diagnose, we’d need a lot more information about the system it’s happening on, the software and hardware installed, and what was happening at the time the problem happened. I’ll throw out some guidelines, so perhaps you can narrow down the diagnosis. The most common causes for the fabled “blue screen of death” fall into four general buckets. While the hardware can sometimes be bad, the real culprit is typically outdated, or just buggy, drivers. If you’ve just installed new hardware, then it’s likely to be related to the problem. Make sure you’re running the latest drivers for that device. Check Windows Update, specifically for “Optional” updates, as driver updates are often classified as optional. Check with your computer manufacturer’s support site, or the support site for the specific hardware you recently added to your computer, for specific driver information as well. It’s rare these days, but occasionally software can cause blue screens as well. If you’ve just installed new software, I’d be very tempted to immediately uninstall it and see if the problem goes away. I’d also make sure that Windows is as up-to-date as possible, once again by visiting Windows Update to check for both “important” and “optional” updates. Over the years, Windows has become much more resilient, but malware can still occasionally cause blue screens, even in the most recent versions of Windows. Make sure your security software is as up to date as possible, and perform a full scan, in addition to the regular checks that the software might perform. If you’re positive nothing’s changed, you’ve been using your system like always, and these problems just started happening out of the blue, then it’s very likely that you’re experiencing a hardware malfunction of some sort. Unfortunately, it could be just about any hardware component of your system at fault. One of the most common is a blocked, stuck, or broken ventilation fan, which is now allowing your computer to overheat. One of the first signs of an overheating computer is the unexplained crash, which often manifests as a blue screen. As I said, though, everything from memory to add-on cards to the motherboard itself could all cause issues here. It may be time for some hardware diagnostic work. If you’re just itching to attempt to interpret all those numbers and what they mean in hopes of figuring out the blue screen yourself, I’ll direct you to Windows Crash Dump Analysis, a post on “Mike’s Technology and Finance Blog”. I’ll warn you that actually decoding and understanding a Windows crash based on the information in a blue screen is incredibly geeky and not for the faint of heart. Most folks are much better off looking at the types of symptoms and behaviors that I’ve outlined above, or asking for help. Where Do I Get Driver Updates? - Device-driver updates can come from several places. I'll review which sources for driver updates are best, and where else you might need to look. « Previous post: Why are there duplicate files on my computer? I WAS DOWNLOADING THE SOFTWARE FROM SLOTS.COM WHEN MY COMPUTER TURNED BLUE . NOTHING I TRY FIXES THIS PROBLEM . I’m not quite sure what you mean by “renewed”. Any recent changes? I’d start with things like the System File Checker (http://ask-leo.com/what_is_the_system_file_checker_and_how_do_i_run_it.html) making sure you have updated drivers for all your hardware and Windows. A memory test might be in order (http://ask-leo.com/d-memtest). Assuming that all turns up nothing, I’d start removing optional components to see which might be contributing to the issue. some times my computer displays a blue screen like some indication of virus problem or secuirity problem on the startup screen. i have 2 PCs one contains Windows XP and other contains Windows98.how i cure this problem or what the prevension should i take to solve this. one day i started my pc to do somework but it displays a blue screen .i restarted my pc and logged on it to safe mode.but the problem not solved.i had not been loading any new software /hardware for this january. tell me the right way to solve out this problem. If your PC blue screens in safe mode, then it is most likely bad hardware. Start by testing the PSU (power supply unit). Then try rotating and re-seating the memory. You may have to test each slot separately by booting the PC with memory in different positions. While in there and grounded, re-seat all plugs on the motherboard and on the devices. You can also disconnect non-essential devices and boot up with only the hard drive connected. If successful, shut down and add each device one at a time and boot. It can get very complicated, but these suggestions should get. you going in the right direction. I was moving this weekend and my computer fell out of the bottom of a stroller (less than a 1 foot drop) on a stone floored kitchen. Now that I reconnected it, it is displaying a blue screen. Not sure where to go from here–I am guessing hardware problem. It is a Compaq Presario, SR1123WM series. I hate when that happens. My hope would be that one of the components had come loose from its socket. I would unplug the computer completely, open the box, and carfully press each of the expansion boards, memory boards and socketted chips back into their sockets. Question: Is it possible to blue screen a Windows machine from an “normal” desktop application (that is, not a service and not a driver) without the “help” of a faulty driver? I have written a piece of software running on a Windows 2003 server. The software is written in Delphi and it is a “normal” desktop application. That is, it does not consist of any drivers and it is not run as a service. It is the only software running on the server. The server reboots for no apparent reason about 10 times per year. It seems to be completely random, except it only happens when my software is running on the machine. Maybe 10 times does not seem much, however this software is extremely critical and 10 times per year is considered a big problem. I am now having a discussion with the guy responsible for the maintenance of the hardware and the operating system of this server. I am claiming that the problem must be related to some driver used by my software. The HW/OS guy says it is “purely” an application problem. That is, he is arguing that it is not related to any HW-problems, not to any driver problems and not to the OS. He says my application contains some bug and that it is causing the server to reboot all by itself. If he is right, could you give me an example of how to blue screen a Windows 2003 server from, say, a VB or Delphi application? What Windows API-call should I make to make the computer blue screen? I thought only software running in ring 0 could blue screen the computer. Am I wrong? I do believe you are correct. An application needs the “help” of something in the OS, drivers and the like. I have been having problems with my PC since I have upgraded Windows 98 to Windows XP. When the Windows XP gets started, it works well only for 5 to 10 minutes and then, either BLUE or WHITE blank screen appears. Everytime it happens, I have to restart my PC!!! Please, suggest me what should I do to overcome this huge problem. I have an old compaq desktop computer and for about 4 months now it has blue screened me almost everytime I am on it. Now I get an blue screen that I cannot get out of. I held the powwer button on and it shut off but now it comes up with another error that sends me to choose which method I would like to start up in ie safe mode, normal or last good connection(something like that) I tried all three and comes back to that blue screen. I can’t even get on the web. I put my parents email up top if you could respond to me. Thank you. i recently had a virus on my pc and removed it, i play world of warcraft on line and sice i formatted my pc i keep on getting corrupt files. i brought a new hdd and my wow worked fine for a while, while i play the game for 2-6 hrs, i get a BSOD with error nv4_disp, i have the latest dx9 and nvidia drivers, sometimes the game kicks me out and tells me it soesn’t pick up my 3d in the game or my dx9. or i’ll get a new BSOD with error ISDN_u.sys. or during bootup i get BSOD. what can be the problem here?, i checked my new hdd, RAM, acc card, can it be my m/b? Hey my computer blue screens alot. I installed norton internet security 2006 and it started makin my computer shut off by its self. So i uninstalled it, and now it blue screens all the time and i have removed all hardware. Why is it doing this? It usualy does it when im scannin.. WOuld scannin it in safemode help? Try working and scanning in safe mode with networking. If nothing happens then it is likely a hardware driver or other software that is not running when in safe mode. tyr changing the graphics aperture size to a small er one eg. 64mb for a 256mb card in you system bios. Hi. I have a COMPAQ laptop and recently the screen was turning blue. I thought it was the pixels but as I looked beyond the blue stuff, I see static- like movements. What’s wrong? I agree with Mr. Fred,that the majority of blue screens are created due to a driver problem,particulary with video,and sound cards. If your running a creative sound card on an xp sp2 machine it can cause all kinds of blue screen errors. The card will make a user feel like they are compelled to cram a 5 foot bat right up its power supply lol! But seriousely Creative labs does have a trouble shooting application that will search for all of your computers hardware,and detect the correct drivers that will be compatable to the other hardwares you have installed,otherwise the standard creative drivers will often fail. Also ive found out from experience that the nvidia graphic cards are also a culprit in blue screens. Originally when I built this new machine from top to bottom,I had to learn what works and what doesnt. As an example I first decided that I wanted a dependable motherboard and everything else would be built around the Asus a7n8x running the last AMD XP Athlon 3200+ processor,the mob has the nvidia chipset with onboard sound,so I decided to purchase an nvidia 64 mb graphic card(I could always upgrade later)the nvidia graphic card had the elixer video 3200 ddr ram,so I purchased 2 512 mb elixer ddr ultra system ram,the numbers on the ddr graphic ram was the same as the ddr system ram,when I went to start the system there was no problems,I then attempted to install a newly purchased copy of windows xp home,it would start installing,and suddenly durring the hardware check xp would exclaim that certain hardware was not compatable with windows xp. After several tries I went into my bios turned off the onboard sound,and again attempted to install xp,it started its original ritual and then kept rebooting,I then discovered by turning off both caches on the processor got rid of the rebooting problem,but it did make the xp install excrutionating slow,once xp was finally installed it almost booted up and bam it kept restarting,going into bios again did not help,so instead I removed all non essential hardware,modem/lan etc. computer booted up completly(after I turned the L1 and L2 caches back on)of course the problems kept returning finally I purchased a new sound card but it didnt help,as I couldnt get it to work at all. I then bought a new gigabyte ATI graphic card,after that no more reboots,I then installed the creative sound blaster live application downloaded the compatable driver sound works fine,and havent had any problems with it since. Of course a 500 watt power supply came with the computer case that I bought with all of the fancy lights,and other gadgets such as the face led readouts for hardware temps monitoring,but I also changed it out and installed a 600 watt power supply,insuring that I have plenty of continuouse power for all of the addons. A power supply that is not providing enough power,or is not functioning adequatly,or if the computer hardware is over heating may cause any of the blue screens as well. Do not forget that if your running fast memory,and the mob doesnt support it,it may cause problems as well. I also read one of the other posters that stated that their blue screen has many lines in it,this sounds like it may be related to the graphic card settings,if you can get it to boot up try to slow down the refresh rate for your graphic card,and make sure that the refresh rate that you set coincides with your monitor’s capabilities,as an example if you have a monitor that can handle a refresh rate of 65-70 do not boost the resolution higher that your monitor can handle otherwise you will get scratching screening,and may not be able for your graphic card to boot. If boot failure happens check your mob manual to see if it has a jumper that allows you to reset your bios settings,some mob’s now have jumperless boards that is if they reboot for such a problem you have to just simply reset the settings in your bio’s. I could go on for the blue screen problems but Ill stop for now,hope this helps,phew! that was long. I had an Identical problem as Posted by: peter at April 4, 2006 12:04 PM. It has taken me 8 months to solve the problem, neither Dell (my computer manufacturer), Hayes (The manufacturer of my ISDN terminal Adaptor) or Microsoft seemed able to help despite numerous conversations. I have not had a BSOD since!! I love all of these PC experts answer on this. Most of them are wrong and they are just guessing. When a PC bluescreens, 9 times out of 10 its always a bad stick of RAM. Change it out and your problems will more than likely be solved. I don’t know if Stvn is correct that it is usually a bad stick of RAM. I do know the the BSOD error I was receiving that was highly likely cause. The last BSOD happened when I was changing the settings in Windows Media Player. Windows 7 corrupted? I restored an image made about 6 weeks before the BSOD’s started hapening. Then I replaced x 2 2 GB of RAM with 2 x 4 GB of RAM. It is now a month and no BSOD. RAM is cheap. It may be worth a test provided you don’t need to remove the motherboard to do so. Does someone know how John fixed this problem? I have similar problem like others. I’m getting BSOD like these: DRIVER_IRQL_NOT_LESS_OR_EQUAL, PAGE_FAULT_IN_NONPAGED_AREA. Sometimes it’s during playing some game, and everytime when some Internet browser connects to crl.microsoft.com (I was trying to verify signatures of drivers). My configuration is: MS motherboard, P4 – 2.7Ghz, 1Gb RAM (dual line), FX5600, 2xATA HDD on Raid (Silicon Image), Windows XP Home with SP2 (up to date). I believe my problem is in that raid. Cause in previously installed windows, this hardware (raid) wasn’t specified and all was ok, but now the system found it by itself. So finally I tried to put the latest driver from manufacturer (Silicon Images), now I’m able to connect to crl.microsoft.com (but the drivers aren’t still verified) and I hope that it’s fixed for now. When I start my Dell Latitude (c-510/c-610 w/ Windows 2000 Professional ed. ), everything looks like it is booting-up okay, the little loading bar graphic finishes, and then the screen goes completely blue (no graphics or text at all) and it starts going “ding, ding, ding, ding, ding…” I turn it off and restart it. Same thing. Over and over. Any idea what’s wrong? so wth am i supposed 2 to ? I have been getting the blue screen and it points to this dll: ati2dvag for the past 2 days. I am running Windows XP and have Office 2003 on an HP compaq NC6000. The blue screen occurs when I paste an image from Visio to Word. The last software I installed was TurboTax and no new hardware. I tried researching for a solution to the dll and I saw a software called Registry Booster which I bought and this has helped with the slowness at startup. however, I still keep getting the blue screen. Any help would be GREATLY appreciated! hey even i too getting same blue screen and it says bios problem call the adminstator or remove some programs in safe mode.plz help me to identify the problem,wats the reson(majority). thank u.according to me its better to call the service person. I had some kind of similar problem with my IBM laptop ..when i installed horoscope exlporer 3.0 on my laptop it worked fine but the next day when i updated my pc through windows update….the immediate next moment when i started horoscope explorer it went of to the blue screen stating “IRQL NOT LESS OR EQUALL TO” ERROR AND SAID KERNEL FILES HAD SOME PROBLEM ..The next step of mine was to uninstall all the 8 updates i downloaded & installed ..once i completed the program started working properly again ..so i came to know that the probem was with the updated that resulted in blue screen.. When I boot-up , my DELL Inspiron 6000 (OS: Windows XP/Home Edition), It looks as though everything is fine. Then the infamous blue screen comes on. I’ve re-booted numerous times, and even pressed F8 to enter the system in Safe Mode to attempt to save files and documents that I had saved on my hard drive; also, to uninstall programs that I recently uploaded on my system. I don’t know what else to do!!!!!!!!! that using a branded OEM install disc could cause problems. from keyfinder and they agree. if Dell has moded the install enough tio make it unstable on generic hardware? Would I do better to buy a retail CD/key and try again, or would reinstalling fix it for a while. Laserjet 4, USB Bluetooth (Widcomm based) dongle. again? Maybe the Dell flavor doesn’t like my home brew? I’ve gotten a lot of BSoD errors with corrupted DLL files, I removed and re-expanded them from recovery console, but it shouldn’t keep happening. One time I was told the boot process couldn’t find NTLDR and I had to extract/copy that from the recovery console too. something is wrong here. even Windows sho0uld be more stable than that. copied to one of the other hard drives, I have either CDs or ISO’s of the CDs for the apps. I guess I’m asking should I try again with the Dell branded CD or buy a new retail CD and use that to reinstall. Hello, I have windows 2000 Nt With microsoft 97. We do have spyware and virus protection. I get the blue screen every single time time I open certain myspace pages or radio station websites. It is always the same webpages that shut it down. My computer programming teacher told me to google this part of the code (1eco) that is appearing and I am not finding anything. My teacher thought it might be a virus? It also says KMODE_exception not handled. What is Registry Booster? My husband did find that on the internet and after he tried to click it off it kept reappearing and would not stop. I did notice that someone else was talking about the registry booster also. We have not installed any new software since this began to happen. I hope this answers all your questions. Thank you for your time! hello sir before 2 month my computer was restarting continueously I replaced my ram(simmtronics 512). I just bought a new desktop a month ago. Dell:Inspiron 530S with 2GB memory, 320GB hard drive, 2.20GHz, 667MHZ FSB, windows XP-home edition. I have had a blue screen for 4 times now with the same stop error: 0x40000080 also indicating the complete dump of physical memory. Dell customer service had suggested that I should delete any new software installed by me and also try to restore my PC if problem occurs again. After un-installing the sw, I downloaded some songs and the blue screen appeared again after a week twice in a row. I restored my PC both times, but the blue screen still comes up even at the time I am not surfing on net. I don’t want to keep restoring my PC everytime an internet error has been suspected to enter my computer. It means, if any time I download something or just surf on the internet, I might end up running into this problem causing me to delete the files that I need. Do you think something might be wrong with the system hardware, memory or drivers?? Please help me find a different solution to this problem as I am not having much fun with the blue screen. I was glad to see Mona’s note of March 9, 2008 about her new Dell Inspiron 530S. We bought the same computer in February ’08 and have the same problem. We couldn’t resolve it after speaking to their technical support several times and spending countless hours on it. We sent it back to Dell and had it replaced with another. The one we have now does the same thing. It’s also going back. We used the same software that was on our old computer (which worked fine)and did whatever updates were suggested. Just wanted you to know. Thanks for your insight. PS – We have Paintshop Pro7 and now notice a flashing bar pattern running down a picture when we try to work on it in the program. Maybe that’s a hint. I’m not too tech savvy so the above makes very little sense to me, but if you could please help me figure out what to do, I’d appreciate it. I’ve had this computer for less than a month and have McAfee so I doubt it’s a virus, or outdated technology. I’ve also been using my windows updater etc so I don’t understand why this is happening. fix for the problem other then asking me to send it back for a replacement. It sounds as though Dell has a problem with this model? should I request another model? Why is this happening? Hey Leo, I’ve been working w/PCs since the mid-70s, and can Search the web with the best of ’em, but have an occasional BSOD that of course is driving me crazy, because this PC otherwise works perfectly for hours and hours on end. My *sense* is, after many, many months but only few dozen bluescreens, that my ATI x1950pro AGP videocard doesn’t like it when I turn the power off on my monitor! I’ll find the BSOD after powering-back the monitor, then I have to reset the PC. Having lived thru the Energy Crisis of the 70s I have a hard time resisting pressing Off the power button on my CRT-based monitor when I leave my office, but will try very hard to do so and see if the BSODs go away complete (yeah I know about the x19xx AGP series and have the proper driver I think, v7-7). Have you (or anyone) ever heard of anything like this before (PC doesn’t like monitor non-powered)??? Thanks! i just bought a new asus laptop, model F8SG.i am having the same problem like Bhavani. i hope to solve my problem soon as i just bought it a week ago. please reply me asap, thanks. just to add on to the comment i made. i went to change my ram and did a one to one exchange , not only that i also bring my laptop to service. however the problem still appear. I bought a new hard drive, motherboard and memory for my computer and when i try to install Windows, The blue screen appears, and shuts down the setup. What can i do to fix it? My computer doesnt detect up my graphics card after BSOD conflict. I have removed and plugged in parts like the memory sticks etc., replaced the video card with another (same brand and model), updated drivers, replaced psu, wiped out windows vista and did a clean install, I am still having the same problems. Are there any other things that I can do to resolve this issue, do I need to replace the motherboard? The weird thing is that my computer works with the onboard vga connection, my monitor doesnt respond when I connect the dvi connection to my monitor. Yes,this article helped me for an interview. Thanks a lot. my computer tends to get the bsod after i try to turn it off. it usually says memory dump then loads and the computer restarts itself. it usually takes about two tries to turn it off. i really have no i idea why this is happening. how can i fix it? Hey Leo, I just installed a new game onto my laptop, it takes some time to load up… which is fine. But one time when it was loading up my computer froze up, i tryed ctrl alt del, but that didn’t work… i then shut it down by pressing and holding the power button. When i tried rebooting it, I got the blue screen and there is nothing i can do. I was running windows xp, Dell notebook. Hello, I just installed XP home edition as a clean instal and it only loaded 4-bit graphics, and it was using the default monitor instead of the plug & play monitor so I told it not to use the default monitor and now it does not recognize any monitor nothing displays on the monitor now. To make things worse it wont load safe mode so I can go in and fix my mistake. Can you please help me. How do I correct this problem? i have a dell inspiron 1520 with a 2gig RAM and 250 HD. i am frequently getting blue screen with some errors ” microsoft detected some problem and is tying to shut down to prevent files loss”. can you help me out what’s happening? i called the dell personals and changed my HD and OPTdrivers like 2 times when i had warranty ,but still the same. i have a computer with the following specs: 1.7GHz dual core pinless processor, 160GB hard disc (not new), 1GHz DDR II memory. Any time i try to install a new xp operating system onto it, my computer blue screen. please what could be the posible causes and the remedies to consider? out that my hard disk was total lost, anyway the company they give me new (warranty) i reinstall again the windows and now i have again the same symptoms and i am afraid that my hard disk is going to burn again. once I shut my laptop out of anger 🙁 very hard and there screen stopped working for a period of time so I currently plug into a desk top monitor. However, lately the screen seems to be trying to work again. I had multiple colors on my screen that would move around and now it just stays blue. Can you help me? It sure sounds like the trauma broke something and now you have an intermittent connection. You’ll probably want a tech to diagnose it hands-on. Hey Leo, I keep getting the BSOD after like 20 minutes when the computer is on. When I am on it I don’t get it but when idle it gets the BSOD. I recently added new memory, I don’t know if thats the problem because I know I got the right memory for my computer. Its getting pretty annoying. When I turn on my computer I immediately get a blue screen and it says something about “Crash dump memory.” I have received this message before but because I don’t have internet I hardly turn on my computer. My computer did a dump right in the middle of me trying to get more information on why I keep getting a blue screen. I deleted my Norton 360 because the subscription ran out could this be the problem? I have a Systemax (’98) which has Windows 2000 Professional. I turned the computer on and there was a blue screen. It says to restart. I’m getting a message: STOP unexpected-kernel-mode-trap. If this is the first time (and this wasn’t the first time) RESTART. If screen appears again run a system diagnostic utility supplied by your hardware manufacturer. In particular run a memory check. Check for faulty or mismatched memory. Try changing video adaptors. Disable or remove any newly installed hardware or drivers and/or software. F8 safe mode. I’ve got this message in the past and RESTARTING has done the trick, however this time it continues blue screen. My computer is Intel/core 2 duo running Win Vista ultimate version. while i am playing a game or vedio for 2 hours my computer blue screen . I cannot boot in safe mode or any other. I have a stop:0x000000ED(0x82F3EC08, 0xC0000009c, 0x00000000,0x00000000) UNMOUNTABLE BOOT VOLUME It is a Dell Inspiron 5160 it says A problem has been detected and windows has been shut down to prevent damage to your computer. What can I do? Why is this a question I’m asking? There are no results on searches of this error message other places I check including Microsoft error look-up, Forum searches and google search. A friend is getting this, she has not done any un/installing lately she shut down her computer, started it up the next day, the fan was running loudly so she restarted it and gets this BSOD error during start-up. The only search results i ever got were generic 0x000000ed error which is an unmountable boot.And the fixes were never really favorable sounding or were not clear. She can not get into safe mode, or safe mode with command prompt. She has access to Bios. ANY Ideas? or resources for looking up thses error messages? i have a computer with the following specs: 1.6GHz dual core pinless processor, 160GB hard disc , 1GHz DDR II memory. Any time i try to install a new xp operating system onto it, my computer blue screen. please what could be the posible causes and the remedies to consider? Hi Leo. I have an older (5 or 6 years old) hp laptop that I have had no problems with. I moved in August and everything was fine, but in November I started getting the BSoD. I’ve looked up the codes and they point to a bad wireless driver. The thing is, when I bring it to work I do not get the blue screen, which has led some other people to comment that it might be a power source problem. I’ve tried other plugs in the house I’m in now, but keep getting the blue screen. Also, it’s not overheating or having fan problems. How can I find out if it is a power source problem and, if it is, how do I fix it? Thanks. I would first update the wireless drivers. It’s possible that there’s wireless traffic in your area that could, perhaps, be triggering a fault in your wireless card. Since this is a laptop, I’m less concerned about external power – that’s typically “buffered” (so to speak) by the battery. Perhaps the battery itself is having issues, as 5-6 years is a long life for a laptop battery. Unfortunately the only way to know if I’m right (and I could easily be wrong) is to replace the battery, often kinda pricey. HI leo, everytime i turn my pc on it asks me to choose an option so i choose safe mode, thats when the blue screen appears?? whats happening and how do i fix the problem??? It seems most of these problems are from Compaq. I to am having this difficulty but non of these tips have helped. My friend says it could actually be the video cards or adapters. Is this true? My laptop only ‘blue screens’ in certain buildings. Why is this? What kind of toxic signals are being emitted? Hi Leo, Your solutions are a boon for computer illiterates like us. Recently I installed Intel GMA driver 946gz on my PC, this is when it started giving blue screen (memory dump). My PC came with factory installed vista home. I bought an XP professional os and using it. Now I am unable to uninstall the GMA driver(rollback). It is asking for a CD or location for old driver. If I do not do it, it is showing “found new hardware” every time I log in. Please help. i have an acer aspire notebook model no.ZG5.Operating System is linux. I turned my notebook on a couple of months ago and i got blue screen of death. I don’t know what caused it or how it happened because on every website i’ve visited it explains that you cannot get blue screen of death with the linux operating system! Can you help me please? try reformat maybe some viruses. My computer has a blue screen. I try to update my windows and it started to give the Blue Screen. Now I have upload the Window Xp Pro recovery cd but it doesn’t want work. I even format my driver and try to put the Window Xp Home and it would go on then in about 10 minute me being online it would turn back to the blue screen Can you please tell me what wrong. thank you. I came from school and discovered that my PC was having a blue screen effect, I was not in the house and wonders how it could have come on its own in the house. Help me solve my dilemna before I blame my roommate who was there,or could he have performed an operation. I’ve tried to change my blue screen on my computer to a wallpaper, but it wont do anything. I have spyware protection on here so how do I fix this? 9/10 times, the BSod occurs because you have a driver that is outdated and needs to be updated. You can go to the manufactures site to download these drivers. Hope this helps! My Computer screen is blue! I’ve tried everything! I think I did? Even if I can just get my stuff off the computer!! I need Help! I have the blue screen that says page_fault_nonpaged_area etc and it was just after I used windows updates and downloaded vista sp2. nothing repairs it that is available to me, no restore points, which i know there was. cannot use safe mode or no other options. Any help out there? have lots of info I do not want to lose!!!!!!! third time I was agin streaming Divx and the computer would not restart only get to scream where I could press f2 or f12, then go black and back to same scream. I used my recovery disk to start, which put my computer back to its new state. I have noticed that my computer is getting hotter than it use to even with my external fan running. Disable or uninstall any anti-virus, disk defragmentation or backup utilities. Check your hard drive configuration, and check for any updated drivers. Run CHKDSK /F to check for hard drive corruption, and then restart computer. My system affected in security tool. I cleaned security tool removal virus. I have installed Kaspersky 2010. This anti virus protected my pc. But when i was use sfc command, my screen displayed blue screen.Why does my computer blue screen? i got the blue screen when i was updating my mcafee antivirus and on the other side i was defragmenting my D:/ please help me solve this problem….. even i have just formatted my pc and installed winxp black edition 2008. Check your hard drive configuration, and check for any updated drivers. Run CHKDSK /F to check for hard drive corruption, and then restart computer. “Can someone please help me. I restart computer windows is loading than i get this message above. I cant do anything with the computer. Anyone has any information please. guys, most blue screens can be solved by booting up in safe mode (F8), loging in normally and restarting the comp. If not then you can always try some of the other options in safe mode such as system recovery or if you are experiancing this problem after installing software, you can always try a system restore. Some time ago, I ‘cooked’ my laptop (I closed the lid, assuming it would hibernate, and it didn’t – it sat working in the bag until the battery ran out). I know this did damage to the graphics card, as I can sometimes see random pixels in low-res applications, and the laptop will ‘blue screen’ if it gets hot enough. My computer has a totally BLUE screen and when it starts the computer goes right to the options with the buttons “start windows normally” and “safe mode” but i tried everything and my computer doesn’t start at all and i’ve been trying for a while now. does it mean i need a new computer.? Not at all – or at least not very likely. Software problems do not require you to get a new computer. I’d either get a technician to diagnose the problem further, or re-install Windows. In most of the cases of blue screen with the error message “page_fault_in_nonpaged_area” are resolved by replacing RAM/DDR. Finally some one suggested me to use a software that optimized my computer. Blue screen error is due to overheating and memory error, sometimes RAM has to changed. And avoid dust which may block the ventilation and results in overheating…..
i’ve had this happen to several computers and the culprit was often, not always, due to the CPU heat sink being loaded with dust. i have installed avg free after uninstalling that anivirus that problem had gone. Blue screen error on Dell Mini Expiron is happening frequently. The only option is to unplug it & take out the battery when it happens. I’v updated drivers, got SP3 for XP & am at a loss to know what else to do. It happens when online and with only email open. The latest blue screen error is STOP007F. A friend of mine has an HP GX60-235DX running windows Vista, the laptop is 2 years old. When the computer is started up it goes to nothing but a blue screen, I was gonna guide her through a system recovery but I am hoping that there is a minor fix that I can do so as to not put her at risk of losing info she has stored. Nothing can be accessed on the desktop because of it being just BLUE. Is there any pointers out there? HELP IN MAINE PLEASE? Heres a weird one, mine will blue screen when I first turn it on. Now not every time, its happened a totsl of three times once about two days ago and then twice this morning within 20 min. Geeeerrrrr I dont know whats wrong I would expect it to happen when I am ruuning alot of stuff but its on start up. I have a HP Pavilion DV 6000. Got the BLUE Window. Sounds like you have a serious error on your hard disk. You might try SpinRite or having a technician look at the machine. my computer is showing the blue screen of death and im not sure whats wrong but it shows UNMOUNTABLE_BOOT_VOLUME what can i do? Looks like a problem with your hard disk. You can try booting into the recovery console from your installation media, or perhaps try a tool like spinrite. Hope you’re backed up. Hi. A weird blue screen appears on my computer whenever I try to turn it on. So, I reformat it but when it starts to install the operational system, it stops and turns my computer off. I have a new computer, so I doubt it’s the hardware. I think it might be a virus, but how can a virus still “survive” even if we reformat the computer? I’d actually be suspicious of a hardware issue. If it’s a new computer I’d contact wherever you got it from. I have tried everything I can think of from registry cleaners to updating drivers, but I can’t seem to solve the problem….. I need help!!!! Please read the article you just commented on. All the options I have for you are there. My Vista laptop wouldnt boot, and was left unused and unrepaired for about a year or so. Recently I decided to send it for repairs and it was able to boot, although it took about 30 minutes to do so!! A blue screen with “Windows has been shut down to prevent damage to your computer” comes on and the computer reboots itself(another 30 minutes). I managed to do a system restore in safe mode but the ultra-slow startup and blue screen persists. I’m beginning to suspect the power supply fan as you’ve mentioned, as the computer gets hot fast. Actually from your description the slowness to me would more likely indicate a problem with the hard drive. It means your computer crashed. I’m not trying to be sarcastic here, there’s really nothing more that someone can tell without actually seeing the machine. I’d have a technician look at it, or review the steps in the article you just commented on. Other possible cause would be loose DVI cable connection either between the monitor or the comp brain. My computer has a blue screen everytime when I open it so I can’t use it. Can you help me? Probably not. If the bluescreen is immediate it’s almost certain hardware related. You could try a repair install of Windows, but it’d be much safer to have a technician look at the machine. Sorry. hiya mate my notebook loads up and that but then it comes to just a clue screen and only just mouse is visable any ideas on how to sort/fix this? okay.. i just had a shock. i booted my comp as usual.. vista logon screen loads up and.. BAM – as soon as i type in my password a bluescreen comes up with loading some numbers… couldn’t read so fast, but it wasnt a traditional errormessage. after it restarted my computer, it took a while to load up and stated that i had a BlueScreen. and im writing this just after it happened. 1st – Enter safe mode IF you can’t enter normal mode – uninstall avast antivirus using an uninstalling service such as programs and features, ccleaner etc. 2nd – reboot and run the aswclear.exe, choose avast 6.0 and uninstall. then reboot. This has never happened before so I am very confused. When I turn on my hp desktop (vista) it starts to boot up then says checking files. After that it will show the microsoft loadings symbol then all of a sudden a blue screen. I tried turning my monitore on and off so I know it isn’t the monitor! What is wrong with my computer? Please help I’m so desperate! I’d recommend re-reading the article you just commented on. It addresses your question. My computer blue screens randomly every now and again and tells me it is doing a system dump. It is only a month old and I need to find a way to fix it! I’ve run McAfee scans to check there were no viruses or malware but nothing doing. Please could you give me some ideas of how to find out what is wrong with it! So ive had my computer for about 3 months already . then i decided to paint my room . when i plugged everything back in my computer screen was blue . till this dayy ( 3rd dayy ) it still is . can anybody tell me how to fix this ? Well I`ve tried everything! no issues were found with hardware diagnostics,no corrupt files,no viruses, no malware I`ve even restored my computer to factory condition and it still gives me the dreaded blue screen of death. If reinstalling to factory condition doesn’t fix it, that sounds very much like it could be a hardware problem. I built my computer 2 1/2 yrs. ago and started getting Blue Death Screen a year ago. It went from a couple times a month to several x a day. Intel replaced the i5 a month ago, but that did not solve the problem. I downloaded freeware to monitore core temps & found they ran @ 159f-205f with 5 fans! Intel replaced the motherboard a couple days (all warranty parts, I had to rebuild) and it happens alot less frequently. I’m going to reinstall Windows 7 64 bit when I have time to reinstall 45+ prgrams and all updates and service packs. the core temps now range from 98f-150f under heavy load. Many pf the old replies require redacting as they can often be very misleading. Reading a “solution” that is many years old, sometimes over a decade ,does not really fill me with much confidence. i just did a new window 7 on my laptop and after all the process it got blue. Hi Leo, my computer also shows blue screen error when I install any os either try to login to it. It have 22.4ghz core 2 du, 2gb of ram, 10 gb of hdd, 512 separated vga. I had win7 then after that happen I installed xp. But no one work yet, every shows blue screen when at the middle of install. Please help me to be well. it is because I haven’t money to spend on that. Please I’m begging you! If it blue screens during install of any OS then it’s very likely a hardware problem of some sort. Unfortunately it could be just about anything. blue screened out and it took me a while to figure out why…also it wud blue screen during simple startup…and found out that it was the hdd and there was imminent hard drive failure….I wasn’t able to do a recent backup but I had what mattered. so now I installed another hdd and windows 7 home premium. now my battle is finding the drivers for everything ie…….fingerprint scanner…wifi…Ethernet. I downloaded every driver that was on the hp specific website for my laptop model. now when I hit the wifi key on keyboard the Bluetooth comes on I dont have wifi or ethernet drivers that are correct. if I get you some info on my pavilion dm4t-2100 could you see what u could do to alleviate some of these driver issues. u shud have my email pls help if u have the time …thanks and I look forward to more of your articles!!! i was running windows 8 an error occurs and i turn it to safe mode then after a month i rrinstall windows7 on it..the windows installs ,but after restarting the pc there is an error on blue screen that your hdd is not full implemented ,,any help ? Some time my system show blue screen and I can’t read the content.so could help me to get the screenshot? A screenshot will only show the blue screen – because it is a shot of what is on the screen at the time. So it probably won’t be very helpful. I am Fairoze and want to state that i replaced my HP Laptop Battery one year ago. After three or more months of replacement, i found that i have a same battery issue as was before replacement. The battery is genuine i think, but it started showing “Plugged in, not charging” at any %age availability till now. Without power adapter plugged in, it gets shutdown after couple of minutes, no matter how much battery is filled. I am just running my laptop with this issue from 6 months without caring too much about Blue screen, but in the heart i know i have to pay for this one day. But the main issue i am facing now is that that i am having Blue Screen issue all the time since from 6 months. Is it becoz of battery issue that i am facing Blue Screen or anything else, i don’t know? My power adapter is okay i think. I have Quick Heal antivirus installed in my pc. I always update my drivers. Please tell me the solution of it……….It will be ur most kindness if u reply via Email too. Seems unrelated to the battery. Please read the article you just commented on for more.